Many homeowners have heard of the new concept of “dumpster rental,” yet few are aware of what it truly entails. With your local garbage collector’s ability to remove only a fraction of what you want thrown away, it is essential to partner with a dedicated specialist to help you properly dispose of life’s biggest messes. When you seek the leading provider of dumpster rental in Tampa, FL, look no further than We Haul It. Tampa is a beautiful, thriving city situated on Florida’s west coast, near the Gulf of Mexico. Not only is the city alone home to nearly 370,000 people but it is part of the Tampa Bay Metropolitan Area – home to nearly 3 million people. Furthermore, the area’s annual population growth rate is at a staggering 2.47% on average. This means that innumerable tonnes of garbage are produced by local residents and brought to local landfills every year, ever so slowly destroying the environment. This is where our full-service dumpster rental comes in. We understand that a common struggle for local home and business owners is how to dispose of miscellaneous junk, from residential rubbish and remnants of storm damage to tradeshow leftovers and construction debris. What the average garbage truck will not accept, we will! Concrete – special requirements apply. We are proud to own 25 highly spacious dumpster rental trailers to help property owners dispose of these items and many more. 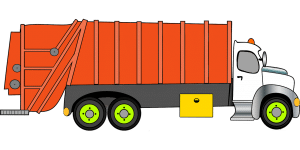 Our trailers feature double axels to withstand even the heaviest items, and are operated by a team dedicated to safe and efficient waste disposal. In addition, we possess complete knowledge of items that may be subject to federal/state/local fines and prosecution for illegal dumping, and we do not accept them under any circumstances. 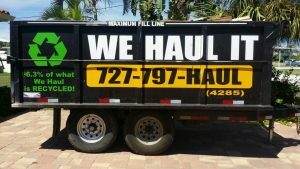 To learn more about our full-service dumpster rental in Tampa, FL, we welcome you to contact us at We Haul It today! Whether you would prefer to call 727-797-HAUL (4285), send us an email or complete our online form, our haul service specialists will be happy to help you get started.